TV IS LIKE A PET.....EXCEPT SOMETIMES IT POOPS IN YOUR BRAIN. That might actually work....at least the glass and frame. Great idea! Thanks. I will have to go do some measuring. I plan on making a few cardboard templates to take with me to the Detroit Autorama this weekend and start checking out bumpers, glass and roof lines. Any Volksrodders going down for the show? I know some of you will be there as part of the panel jam. I will post it in my Gallery , too. I am picking up a second body and floorpan tomorrow for this project. This one is much more solid than my current Fastback. Between the two of them I want to end up with this. The bumpers will have to be custom made. I am going to try adding a couple of large bullets on the front bumper to see what it looks like. Might play with the two-tone balck and red some more too. I think you've got the front end/bumper nailed just as it is [img]style_emoticons/<#EMO_DIR#>/thumbsup.gif[/img] If you were to add bullets Id keep them smallish or I think it will make the front end too heavy looking. I would also like to see it with the Buick trim like Colin suggested and 2 toned. 49-51 Merc sleds are my absolute favourite car. I might do something clean and simple like this for side trim. I kind of like the 2 tone also. Satin Black and Satin Red Oxide. Not so sure about the bullets on the bumpers. Might be right....looks a little heavy. 71 Square-now a 2 seat Roadster under construction now a SquareVert. Picked up the new Fastback bodyshell and rolling pan for the Type 3 VolksRod project last weekend. More pictures in my intro page. Looks like a solid roller John. I should be a good start for you slead. Fortunately, he gave up after that so the trim and seal might still be good on that side and the driver's side is still OK. I will see if he still wants any of the pop-out hardware. 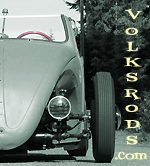 I wont be using it for the Type 3 VolksRod. Might be available to you PapaG. john i want that rearview mirror set up! Hmmm ... I'm really torn. On one hand I like the clean look with no bullets as I'm a fan of keeping things very sparse. But on the other hand, I'm really liking the heavy look of the bullets. It is a sled, after all. Beautiful work. You talented guys amaze me. Yeah, I am liking the bullets as well! Yeah, the eyebrows are staying. I was inspired by the 55-56 Ford Crown Victoria headlight bezels, but I want them molded into the fender, not as a separate trim ring. Plan to do something sort of like Happy Hoppy did with his Ghia headlights....just with a different shape to the reworked headlight opening. I originally looked for a set of the Ford trim rings, but they are potmetal which doesn't lend itself to welding and reshaping at all. Started some mock-up work on the Type 3 Lead Sled tonight. Played around with the rear fender opening, the headlight bucket and the roof line. More info and pics in my Intro. I am open to ideas on fabricating the change in the rear fender opening. I don't want a removeable fender skirt. I want to actually change the fender opening shape. Right now because the fender curves under, especially behind the tire, the tire would rub on the skirt unless I have a funny buldge in it. Might have to try some of the stretching techniques that John Kelly shows in his excellent DVD. Scott (aka joedirt) has one in his Gallery that is sweet. I still haven't figured out how to add pics from the Gallery into a post. Anyone? I think to really get good Lead Sled proportions you will need to chop the top. and the getting the long rear end helps with the proportions too. That is part of the reason I am looking to shorten the roofline of my Type 3 Lead Sled. I have even started thinking about moving the windshield and cowl forward to shorten the hood and make the proportions better. Kind of like this.